BN-Zym is a natural bio-catalyst (process accelerator), medium builder and medium improver based on specific enzymes. Enzymes stimulate the water-retaining ability of every medium and decreases the soil-tension of water, which enables a quicker and better penetration of water into the medium. While BN-Zym penetrates into the medium, it also brings more oxygen into it! Enzymes are specialized protein molecules and work as catalysts in several bio-chemical processes. A few of the most conspicuous characteristics of enzymes is the specific way they work in, and in particular their speed. The conversion of sugar into alcohol by means of chemicals usually takes several weeks or even months, while by means of enzymes this merely takes several seconds! Enzymes always work without any waste matters or side-products. BN-Zym brings about an increased bacteria activity, which convert the nutrients and minerals in the soil into material that is directly absorbable by the crop. 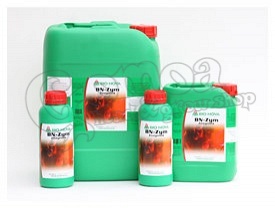 BN-Zym catalysises the waste matters and delivers them back to the crop in the form of absorbable nutrients. The result is a balanced crop and decreased sensitivity to all diseases! Moreover, the medium stays clean and free of all sorts of excess components. This is important for every cultivation, but especially for those in which soil and coconut are being re-used. Medium soil/coco: simply add to the fertilizer solution 30 ml. per 100 litres. Medium rock wool: simply add to the fertiliser solution 30 ml. per 100 litres. Hydro-systems such as NFT AQUA: add to the fertilizer solution 50 ml. per 100 litres.